The Road Pot holes strikes again in my neighborhood. Racontez-nous vos anecdotes ou autres histoires de vous et votre deuche!! Ce sera un plaisir de vous lire. Here we go again in Liverpool. 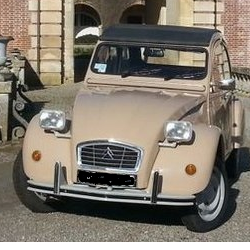 England, Old2cvman stopping bye with another episodic story of every day happenings , in my beloved Citroen 2. C.V. of 53 years ownership . Three days ago, I was unfortunate enough in Darkness about 8 30 .p.m. in hitting a Road Crater at a speed of 20 mph , a mile from my home, the result of this impact Tore the front Offside front wheel of the hub complete, dragging the Three road wheels straight thru the wheels rim . After the necessary work involved recovering the vehicle and getting it home, the following morning I re traced my ordeal journey, to enable photographing the incident, to substantiate a compensation claim of my City Council Highways department, which is now ongoing. as I write this story, while this situation is in operation I have implemented fitting Two refurbished front Axle arms complete with new King Pins..... I am a Glutton for Punishment.... or is this just Dedication..... " I keep asking MYSELF ." Re: The Road Pot holes strikes again in my neighborhood. Tu les cumules dis-donc !! Re: Road Pot holes strikes again in Photographic Presentation. Hello all 2.C.V. Lovers... Old2cvman continuing my latest posting Story of my Misadventures in my neighborhood, and the rectification work involved, in keeping my beloved vehicle alive, all presented in Photographic details, for your pleasures reading my occupational daily Hazards. Feel free to post comments readers... as they stimulate my appetite . I thought english rides on the left side of the road ! This is what Pot Holes can do for YOU... if you encounter them . I know my escapade shows my vehicle on the right hand side in the Damaged road situation... this is due to overtaking residents vehicles parked outside there house Fronts in the Left road Gutter, my escapades happen in darkness, and I am not thrashing my vehicle at speed either... this collision damage was at 20 MPH... I fought the Council earlier this year to re surface this road... I finally won my Battle.. thats why I am King of the Road... NOW FIVE MONTHS later.. its NIGHTMARE ALLY ONCE AGAIN . Only youtube link can be posted in order to have direct view ! Impressive damages caused by this road. Good luck to ride on this gruyere. Another busy couple of day, here in Liverpool, I set too, as a project, to repair my Front Wheel, that was torn of my vehicle last week, I plated it with extra thick metal pieces inside and outside the rim circumference, married up the the original stud holes,all the materials welded perfectly together, and the rim repainted.... see attached photograph. 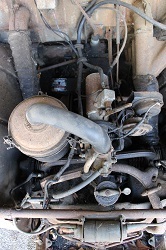 Today I had another task to do, all thanks to reading a members post concerning a metallic cracking noise coming up his Steering column, which I too have recently encountered... I checked the fixing Clamping Bolt to the Steering link out of the Axle, and fitted a New Bolt. However doing this I discovered a pretty worn out Engine / Gear box rubber inserted mounting Bracket, against the underside Engine Bay , a Cow of a job to remove, four hours later, a New Bracket in place, and the old Jallopy is running very happily.... SO AM I . Just a little wandering : your gearbox seems to be a bit far from your silent-bloc (what I think you call "rubber inserted mounting bracket") ? Are the roads well tired in Liverpool, you do not pay your taxes? 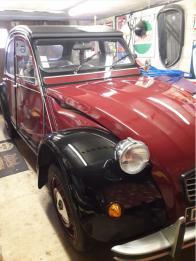 , your 2 cv are puncture-proof! Good road with you and your deuch. zamzam a écrit : Just a little wandering : your gearbox seems to be a bit far from your silent-bloc (what I think you call "rubber inserted mounting bracket") ? Hiya David... re your comment concerning the gearbox mounting block, there are large metal spaces that fit between the gearbox and the mounting block, in tandem on the Bolts they have been on here for the past 53 years.the two fixing bolts are 17.mm. and just slot down into the fork position . Yes, perfect for the video but it is Nicolas (Deuchémoi) who give you the way for it. It seems that you have been heard by the authoritys. 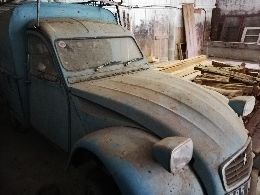 For the metal spaces (entretoises in french) you are right and it's just because they doesn't exist on the olds 2cv (before 65) that I am use to fix. very nice TV show, congratulations !